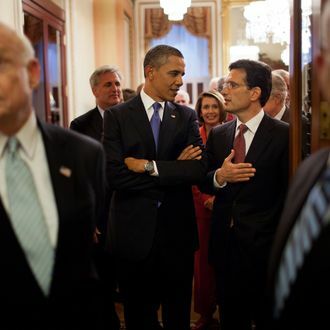 What started as routine bickering between President Obama and House Majority Leader Eric Cantor has turned into a weird fight over holiday greetings. It started on Wednesday morning when the White House marked the one year anniversary of the Senate introducing a bipartisan immigration bill by chiding House Republicans for stalling on immigration reform. “Unfortunately, Republicans in the House of Representatives have repeatedly failed to take action, seemingly preferring the status quo of a broken immigration system over meaningful reform,” said the statement. Cantor issued a sharply worded response, claiming that Obama called him to have a serious talk about immigration just “hours after he issued a partisan statement.” However, the White House says the president was just calling to wish Cantor a happy Passover. By the evening the two sides were mainly arguing over the nature of their chat. A White House official told Politico that it was about the holidays, though immigration reform did come up. “It was a pleasant call,” said the official. “We are surprised by the staff readout, which didn’t reflect the call.” However, a Cantor aide responded that the topic was “assuredly” immigration. “At the end of the call, the leader wished the president a happy Easter and the president ‘responded’ by wishing him a happy Passover,” the aide said. So supposedly, Obama didn’t even say “Happy Passover” first! Maybe the president just wanted to simulate a family fight to make his annual Passover celebration feel more authentic.